A CITY UNDER ONE ROOF-THE MASONIC TEMPLE. of Freemasonry and commerce, a four and one-half million dollar building supplying beautiful halls and parlors for Masonic rite, as well as an unequaled coll ection of business offices. The building is situated on the corner of Randolph and State Streets, in the heart of Chicago. It is constructed of granite, marble, steel and terra cotta as the principal materials of construction, and is fireproof throughout. From street level to apex it measures three hundred and two feet; this in absolute height of structure, not in the mere elevation of a lantern surmounting a dome. For one of the peculiar features of the building is its plainness and uniformity of design, the main features being repeated story after story until the sloping roof is reached. There is no tower or dome added simply to break the record. The building is just what it claims to be and no more. The architects were Messrs. Burnham & Root, of Chieago, Mr. Burnham being widely known as Director General of Works of the Columbian Exposition. The street fronts are of dressed granite up to the sills of the fourth floor windows ; above that they are of terra cotta and brick, matching in color the granite. The foundations are of concrete and steel, the latter being horizontal beams arranged to distribute the column loads, so that a uniform preJsure of 3,500 lb. to the foot on, the clay is produced. The building is of steel frame type, a method of construction now generally followed in large buildings. 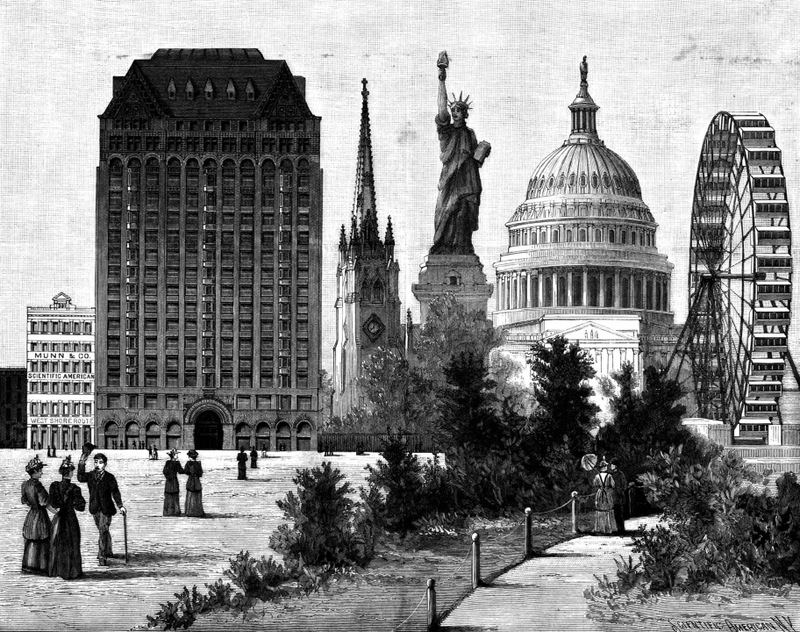 A “City Under One Roof”, showing the Masonic Temple’s height in relation to buildings and monuments from elsewhere in the US. Left to right: Scientific American’s Munn & Co., Masonic Temple, Trinity Church NY, Statue of Liberty NY, Capital Washington, Ferris Wheel Chicago. in front h as but a small load, a twenty·five ton girder running across it at the fourth floor level. Tension bracing, consisting of heavy steel rods, extends in two systems from top to bottom of the building in the direction of least width. The vertical columns are two stories in height, and alternate columns break joints. The general dimensions are one hundred and seventy feet front and one hundred and thirteen feet depth. It is the front which appears in our illustration. 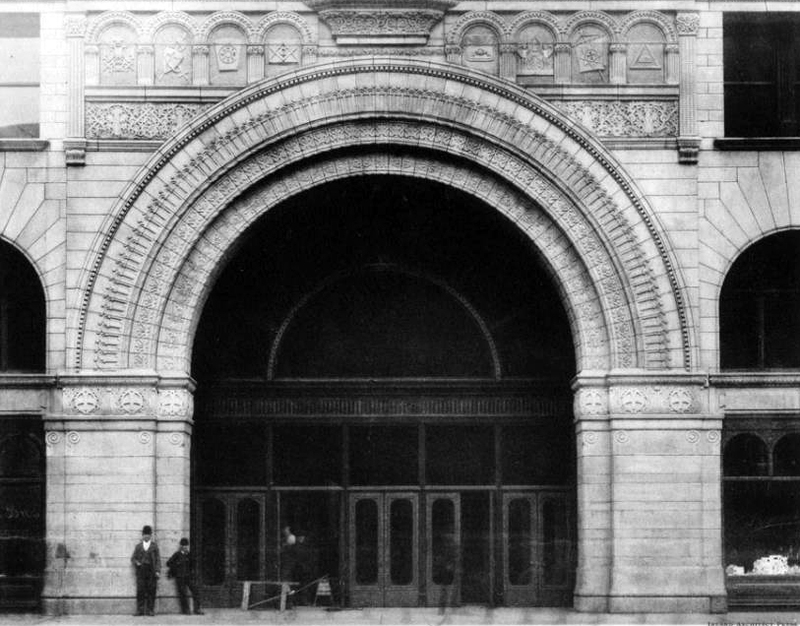 The entrance is beneath a granite arch forty feet high and thirty-eight feet wide, and opens into a great rotunda, lined with Italian marble, and opening upward, through twenty stories. Ornamental iron staircases lead up from either side. Back of this great court is a sort of semicircle of elevators arranged like lights in a bay window. There are fourteen of these, lining an arc fifty feet deep and of seventy feet chord. The court is seventy feet each way, square in front and semicircular in the rear, the rear lines being determined by the elevator fronts. The elevator plant is one of the features. Of the fourteen passenger elevators, seven are for express service only, not stopping below the tenth floor. The others stop at any floor desired. Owing to the great height of the building, the weight of the steel suspension cables became a serious problem, and was dealt with by counterweight chains attached to the bottom One of each elevator and drawn up by it. These prevent any irregularity in the weIght to be raIsed, due to dlfference of elevation, which, otherwIse, would have been very great. The elevators run at a speed of nearly nine miles an hour, and ascend 258 feet. Allowing continuous ten hour service for each, their aggregate travel in one year would be over 128,000 miles. Thirty seconds is ample time for the full ascent. There are also two freight elevators. The wire ropes of the elevators aggregate sixteen miles in length. The rotunda is surmounted by a glass roof 302 feet above its mosaic floor. The windows and balconies of the twenty stories open upon this shaft. The twenty-first story is properly the roof. It is a roof garden, and is devoted to purposes of observation, and may be used for commemorative or festival occasions. It forms a great platform, enclosed by walls and ceiling of glass, with oak panels, steam heated, and capable of accommodating 2,000 people at one time. It is the highest point of observation in the city, and gives grand views in all directions. Around the rotunda galleries are carried for the first ten stories. Shops open on these galleries, with show windows, exactly as in a street. The stories from eleventh to sixteenth inclusive are for offices; the remainder are for Masonic uses. The general features of the court and balconies include mosaic floors, marble soffits or under surface of the balconies, alabaster-cased columns, bronze-finished hand rails and metal work, and marble-lined walls. The water supply plant comprises pumps with a combined capacity of 2,000 to 3,800 gallons per miuute. The pumping machinery circulates each day, if reckoned in gallons passed through the pipes, enough water to fill a reservoir 240 feet long, 100 feet wide and 50 feet deep. The roof tanks alone provide storage for 7,000 gallons. The cellar has still larger tanks of 18, 500 gallons capacity. Wrought iron pipes with screw joints are used for water supply and for sewage, all taking vertical courses and placed in special pipe chambers or pockets. Part of the drainage goes directly to the sewers ; part is delivered to a tank in the basement, whence it is forced by steam injector into the sewers. For heating about 40,000 square feet of steam radiator surface on the overhead system is provided, and a sixteen inch steam pipe is used for their supply. The electric light plant includes some 7,000 16 c. p. incandescent lamp, operated by six 1,000 lamp dynamos, the latter driven by high speed engines. Two sets of electric mains are carried through the building, all cross connected and of large size, to prevent any danger from heating. It is estimated that there are 53 miles of electric wires, and the weight of the rest of the electric plant has been put at 50 tons. To allow for settling, the building was started a little above the proper street level. The settling was so accurately calculated that it is now at the proper level. Our illustration is designed to show the great size of the building. On the right of the cut is seen the great Ferris wheel, 265 feet high, next comes the Capitol at Washington, 288 feet high, the Statue of Liberty in New York harbor, 301¼ feet from wacer level to the toren, then Trinity Church spire, 284 feet high, and then the Masonic Temple. 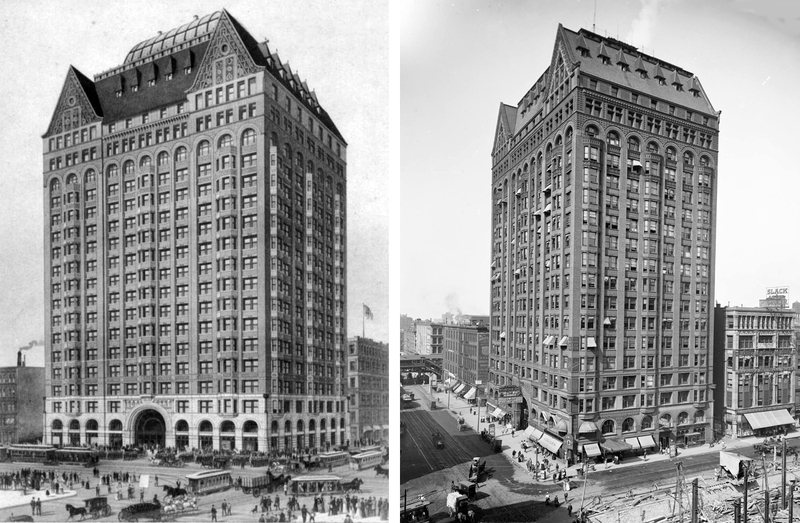 To bring it within everyday comparisons we show adjoining it a typical New York City fireproof, first-class office building, and next to that. on the extreme left, a four·story “brown-stone front.” It will be seen that the mammoth pile dwarfs everything shown. The majestic and artistic pile of stone, terra cotta, marble, and steel, that stands on the corner of State and Randolph Streets, in Chicago, will be eloquent in the description of the wonderful human energy and enterprise for many generations. The highest building in the world, built by an ancient and honorable fraternity, comprehensive in design and impressive in appearance, it will prove an object of interest to all who admire the magnificent architectural achievements of our century, and to those who feel a pride in the power of human intellect and patience of human perseverance. The corner stone of the Masonic Temple was laid on November 6th, 1890, and marked the most notable event in operative Masonry since the achievements of ancient days. November 6th, one year from the day of the laying of the corner stone, the last stone of this marble structure was placed in position. The ceremonies of laying the corner and cope stone of this colossal monument were conducted with fitting dignity and grandeur by the various Commanderies and Grand Lodge, and over five thousand Masons, and a much vaster concourse of interested spectators, which formed a procession nearly two miles long. The Masonic Temple Observatory is, by actual measurement, 32 feet higher than any point of observation in the city, and vast numbers of people visit daily, this most popular place. The elevator system is the largest in the world. Fourteen passenger elevators are capable of carrying 100,000 persons daily, and the pumping apparatus used in connection therewith is capable of supplying water every day to a town of 60,000 inhabitants. The wire rope used in the elevators, would, if stretched out, reach a distance of 16 miles. The safety chains used in connection with them, would, if in one length, stretch over a distance of 3,920 feet. The amount of water that passes through the pumping machinery every day, would make a pond 240 feet long, 100 feet wide, and 50 feet deep. If the distance traveled by the 14 passenger elevators was in a continuous, the elevators will have traveled the enormous journey of 123,136 miles, or nearly five times around the earth each year, allowing only 300 working days in that time. There was used in the construction of this building, 4,700 tons of steel, 16,000 tons of fire proofing, (1,600 car loads), and 800 tons of steel rails in the foundation. When the clock tower was removed from the 1885 Board of Trade Building in 1895, the Masonic Temple became the tallest in the city. 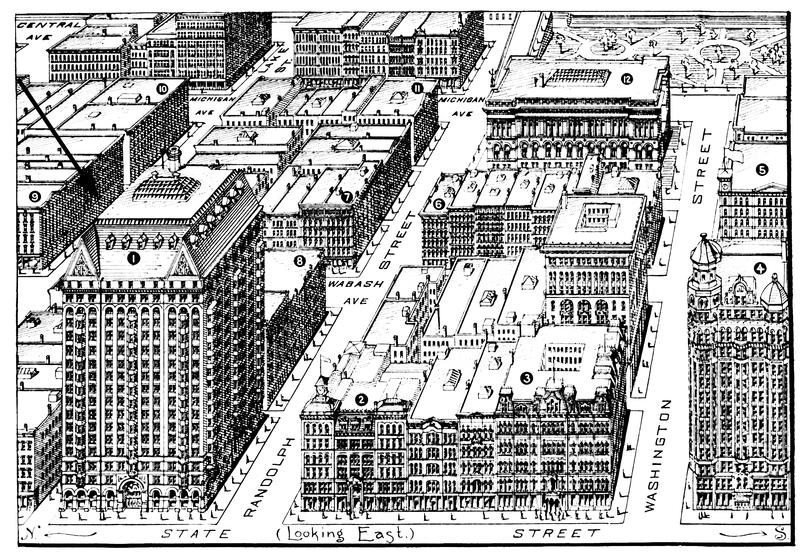 Chicago’s building height regulations enacted in 1892 (the year the Temple was built), didn’t allow taller buildings, until that was amended in 1920s. In 1939 the Masonic Temple was demolished, in part due to its poor internal services, but also due to the construction of the new State Street subway, which would have necessitated expensive foundation retrofitting. A two-story “taxpayer” housing a Walgreens drug store was erected in its place, and the Joffrey Tower currently stands on the former site of this building. 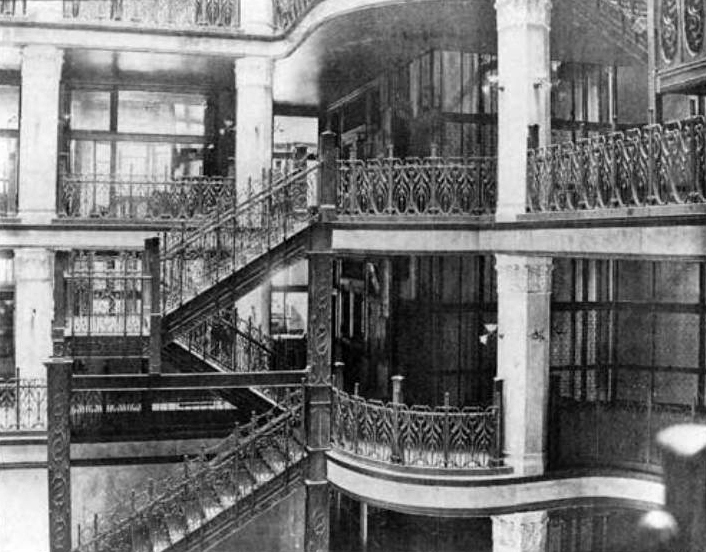 Both the building’s primary designer, John Wellborn Root, and the Masons’ primary representative, Norman Gassette, died of natural causes during its construction. The Capitol building, which as the Masonic temple was for decades Chicago’s most famous building, Is being torn down. The wrecking job Is a substantial one. Physically the structure Is still sturdy. The walls and floors are virtually as sound as they were In 1891. Elevators and other facilities, subject to regular inspection, have been kept in safe condition. Economically the building Is worthless. Th!s Is partly because of the surplus of office space in the loop. The speculative building boom of the 1920s hastened the end of the older buildings, but it was not primarily responsible for it. They were wearing out, anyway, not so much in their physical features as in their usefulness and convenience. The tax assessor recognizes this condition more fully than does the average property owner. Buildings are assessed, basically, on their cost of reproduction, less allowances for age. The CapItol building and other structures of similar age are carried on the assessment books at a minimum figure, one-fifth of the cost of reproducing them today. How much of this 80 per cent reduction represents physical depreciation and how much obsolescence, or the failure of old structtures to measure up to modern standards of con- venience and utility, the assessor makes no effort to determine. But by observation – rather than depreciation would seem to be the major factor. Electric Scenic Theaters In the Masonic Temple, Chicago. The love of the American people for anything that is novel and pleasing to the eye was abundantly exemplified last year at the electric scenic theaters at the World’s Fair. These places of amusement were among the most popular places at the exposition, and they have since been widely imitated and reproduced, sometimes with extended improvements and with more attention paid to detail. Those in Chicago who did not enjoy the opportunity at the fair of seeing the scenic effects which were produced upon stage pictures by the aid of electricity, and who were not able to avail themselves of the chance offered by Steele MacKaye’s spectacle, the “World Finder,” at his suddenly terminated venture in the “Scenitorium,” maygratify their tastes for amusement of the sort in the recently opened summer garden on the roof of the Masonic Temple. The garden in itself, 302 feet from the ground, is a sufiicient at traction to draw crowds. Interest, however, centers in the two scenic theaters which are located in small houses, reminding one/forcibly-in style of decoration of the general idea of the World’s Fair buildings. Each theater is designed to accommodate about 75 persons comfortably, and opera chairs to that number are provided. In the first theater an Alpine scene is presented, the scenery of which, although very pretty,recalls too forcibly the theaters which were made familiar last summer. A mountain stream forms the motive of the picture. Upon its banks the houses are built; a church stands near by, while a mill in the foreground presents an opportunity for a waterfall, after the water has passed over the mill-wheel. A bridge spans the stream, over which villagers pass to and fro; upon a mountain side stands a castlc,while snow-capped peaks stand out in relief against the sky. The scene is called “A Day in the Alps” and begins with midnight, by the tolling of the bell. The break of dawn and the heralding of day present a faithful resemblance to the original and is particularly well done. After the day has been begun, a thunder storm approaches and passes over, accompanied by vivid flashes of lightning and the roll of heavy thunder. The evening is accompanied by the lighting of the street and house lights,and the moon rises, until the clock again announces twelve. The scene is shown upon this page, Fig. 3. Back of the scenes a complicated mass of electrical apparatus explains many of the pretty atmospheric changes. It is not the intention of this article to describe in detail any of the devices employed, for many of them were devised to suit the requirements of this particular case, and the others have been already mentioned in the columns of this journal. Focusing lamps, rheostat boxes, switches, reflectors and many devices of a similar character are present in abundance and are confined in an extraordinarily small space for the many effects produced. FIGS. 1, 2 AND 3. The second theater presents as a stage setting the view of the Court of Honor at the World’s Columbian Exposition, looking northwest from the west end of the agricultural building, and is most perfect in point of detail. The scene is introduced in the morning, and the sunlight illumines the buildings, including the Palace of Mechanic Arts, Administration Building, Electricity Building, as well as the MacMonnies and the two Electric Fountains. The lagoon is well supplied with gondolas and electric launches, which, although stationary, add much to the scene. In detail the scene is perfect. The statues are faithfully reproduced, and one has but to close one’s eyes and listen to the music which accompanies the scene, to imagine that the band in the band-stand really is playing and that the crowds are not mere paste-board fancies, but are living beings admiring ina wondering way the beauties of the departed White City. The approach of evening presents the finest opportunity for a display of the resources of electricity in the presentation of this scene; as dusk advances the lamps scattered throughout the grounds are lighted, the stars begin to shine, now one building after another is illuminated, and soon the border of cornice lights,which extended around the Court of Honor and which was so much admired at night, adds its long lines of light to the scene. Searchlight effects flash from one building to another, and administration building, with its handsome decorative lighting scheme, shines resplendent under these streams of light. At last the lights are dimmed and the electric fountains, this time, fortunately, unaffected by the winds, begin to play. Many of the designs employed upon the fountains at the fair are used here, and the interior illumination, made by a Packard mogul lamp of 300 candle power, presents the usual changes and studies in color. When the display reaches its end the evening is far spent and the moon is seen in a locality warning the fair visitors of the approach of midnight. Perhaps because of its reproduction of a scene that is held in such regard by those who visited the fair, the second theater seems more attractive to all but those who have some idea of how all of these effects are produced, forthe possibilities of the Alpine scene are much greater in regard to electrical effects. The scene in Fig. 2 shows the fair at midday. The second theater is provided with the luxauleator or curtain of light, originally designed by Steele MacKaye and illustrated and described in the WESTERN ELECTRICIAN of February 24, 1894. It consists merely of a border of incandescent lights around the stage opening. It is outlined in Fig. 2. In the Alpine scene 160 16 candle power and 20 one candle power incandescent lamps are used, and in the other scene no less than too one candle power lamps, taking four volts, are used alone. While the theaters are the most interesting from an electrical point of view, the garden itself is not without electrical attractions, and more are to be added, which will equip it with some of the finest of display lighting. It is the intention of Sosman & Landis of Chicago, the scenic artists under whose management the venture is being run, to make the place both attractive and cool, and potted plants, flowers, flags, paintings, fan motors and ventilating fans are abundant. From the roof hang vari-colored prismatic glass globes containing incandescent lamps, and refreshment booths, electric organs, phonographs and other electrical and mechanical devices are furnished for the amusement of visitors. Upon entering the building a visitor’s attention is attracted by a large sign composed of incandescent lamps in the form of a hand pointing upward and the words “Electric Scenic Theaters.” From the tip of the forefinger of the hand a row of lights extends upward the entire height of the building to the garden. This is called a “chaser,” and the lamp globes are of different colors. By means of a switch light passes along the line, changing in hue as it ascends, until it reaches the glass roof of the building, from which are suspended over the court three chandeliers of incandescent lights, connected by radial lines of lamps, an idea of which, as well as a partial view of the garden, is presented in Fig. I. There are 105 red, white and blue lamps in the central cluster and 84 in each of the others, while the radial lines are composed of 240. There are 175 lights in the “chaser” and 234 in the hand and sign. By means of the same switch which regulates the light upon the “chaser,” patterns of pleasing figures are formed upon the court decoration. This switch, as well as many of the devices in the theaters, was designed and built by C. D. Baker, the electrical engineer for Sosman & Landis, who has displayed much ingenuity in many of his special applications. It is a wooden, cylindrical commutator upon which are fastened lugs, which act upon 60 quick-break switches, mounted upon a slate board. The commutator is revolved by a small Crocker-Wheeler motor, of which many are in use throughout the garden, by means of belting and worm gearing. The apparatus is so designed that changes can readily be made upon it as new combinatiors suggest themselves. Near this switch is located the board con trolling all the current used in the garden and its signs, and which is furnished by the plant located in the basement of the building. About 700 amperes was contracted for, but it has not as yet been necessary to demand that amount. The board, which is made of slate, is a novelty in its way and is but three by six feet. Sixty circuits enter it and are controlled by one main switch, four separate cir cuit switches and 23 individual switches. Eighty sets of fuse terminals are placed upon it, as well as other instruments. It is but fair to state that all the improvements which it is intended shall make the place a most attractive one have not as yet been made. Much detail is to be added tothe theaters and much in the way of popularizing the garden is yet to he done. All the lamps employed are of the Packard type and range from one to 300 candle power. Whether this form of amusement, which is novel, will be successful in drawing paying crowds is a matter for conjecture, but the place is certainly worthy of a visit from those who enjoy beautiful scenic effects without action and a superb view of Chicago from its highest building. Several Novelties Provided for Visitors to the Lofty Amusement Place. The Masonic Temple roof garden reopened last night under the management of George A. Fair. Everything connected with the roof garden is new, and the visitor last night saw but little to remind him of the same place last year. The electric scenic theater still remains, but the other stage has been moved around to the northeast corner of the roof. The present location affords a good view of the entertainment from every part of the roof. Directly In front of the stage are 3,510 opera chairs. while the rest of the floor space is given up to refreshment tables. A new feature of the garden is the concrete walks built around the dome of the roof, where an excellent view of the city and surrounding country can be obtained. It is the intention of the management to remove part of the glass roof, affording the an opportunity of enjoying the view and listening to the entertainment going on below. A large crowd gathered in the garden yesterday afternoon to listen to Brooks’ Second Regiment Band. and last night an excellent vaudeville entertainment drew another large crowd. The second part of the program is aimed to attract the after-the-theater crowd, as the roof garden expects to have its largest patronage after the regular places of entertainment have closed. Love the history of this magnificent building.